Sunday the 14th the best day so far in 2017. A small visiting group took advantage of the day to explore the ridge, some as far as Brampton near Carlisle and to Hawes to the south. 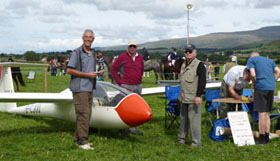 Several gliders explored the air over the lakes and everyone had a very enjoyable day doing what we all love to do. We had to call down the last intrepid Ventus pilot at 8.00pm as the last K13 flight of the day landed. The ridge was still working nicely but most of us wanted to go to the pub! October 5th, 2016...it looked like it was going to be an interesting day at 7am when the wave bars were all over the sky as I came out of my caravan to give the dogs their first walk...need to get a move on and get to the airfield. On arrival I was expecting dozens of people to have turned up, but no. Rob Hanks was Duty Instructor for the fortnight with his wife Fay, Andy Spray, Andy Jones and Frank Bradley and that was it. Wow, this was like “millionaires gliding” - having all the facilities to ourselves! As Andy S was rigging his own PW5 we DI’d G-CFGR and dragged them both up to the North end of the field. Wind was SSE at 15-20kts. The wave was still there but looked very high...could we get up to it? First flight. I asked Rob to come with me as I had never flown in wave so a little help and advice would be appreciated. Good launch from Andy J - 1,400ft. We managed to gain a few feet in the patchy, strong lift but finally gave up after 10 minutes. The approach was high, fast and very steep - the final turn behind the fir trees was very rough to land alongside Andy S’s PW5 that was somehow in the middle of the field. We towed back to the launchpoint to find Andy had launched and had a weak link break at 700ft explaining his short flight. We all decided to hold on for a while then, around 1pm, Andy decided to have another go. He reported a good launch height of 1,500ft and he was away. Rob and I strapped ourselves back in and went off in pursuit. 1,500 ft launch - thanks Andy. Good strong lift up to 2,000 in no time. Push forwards (South). Lift getting better but still rough. Up and up. 3,500 ft and we are still almost over the field when suddenly it all goes quiet and as smooth as you like. Wave. Now I see why people go on about it so much. 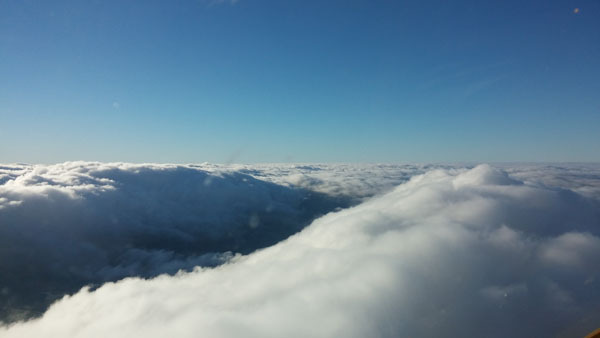 4 up with a wall of cloud to our right and bright sunlight and blue sky above us. Fantastic. We start to head South East with an almost constant 2 to 3 up on the vario. Down to Appleby with a fantastic view of High Cup Nick making sure to keep out of Warcop. We keep pressing on and soon Kirkby Stephen and the Settle-Carlisle railway are clearly visible below. We are now hopping from wave bar to wave bar heading South and up. We pass 5,000ft. 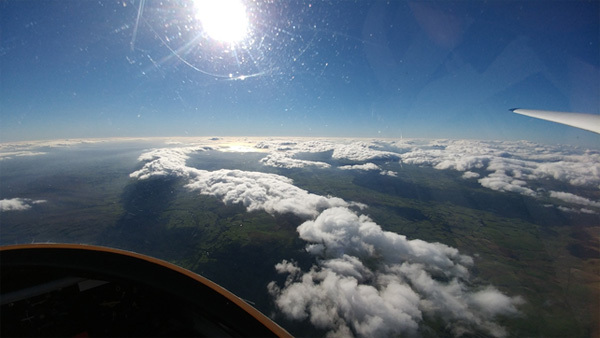 We turn and fly SW along a very pronounced bar and in no time are treated to a spectacular view of the M6, River Lune, Tebay and Killington Lake Services and the magnificent Howgill Fells. 7,000ft and climbing. Carry on SW. Andy S. reports 8500ft We can now see the coast at Heysham with the distinctive blocks of the nuclear power station. Then, from behind a distant cloud, Blackpool Tower appears. We are hearing radio calls from everywhere, from a downwind call at Rufforth to a traffic call at Lleweni Parc! Andy reports having an RAF Hawk pass at least 2,000ft below him and he is now at 10,000ft. We press on, still climbing. 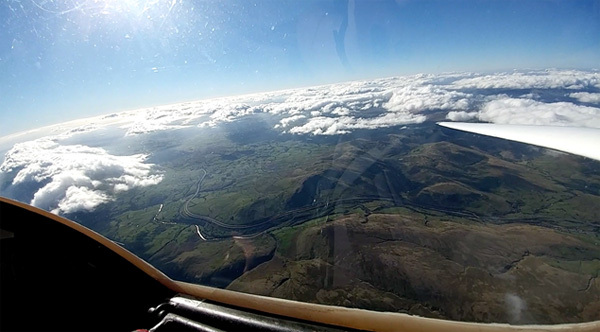 We pass Sedbergh and Kendal and are approaching Kirkby Lonsdale when we hit our peak altitude of 9,100 ft. The view is breathtaking. Wave bars as far as you can see, the coast at Morecambe we can even see Ribblehead and Dent viaducts on the Settle-Carlisle line. This far south we toy with the idea of flying into Bowland Forest GC at Chipping as it is closer than Edensoaring, however finding a willing and large enough retrieve crew may have proven difficult so, even though there are still wave bars to be explored, we decide to start heading back. The flight back was just as good. Still getting excellent lift all the way and having to use full airbrake all the way down from 6,000ft (which feels really counter-intuitive after you have tried so hard to climb!). We get back just behind Andy and watch him land to get an idea of wind strength - looks quite rough still. 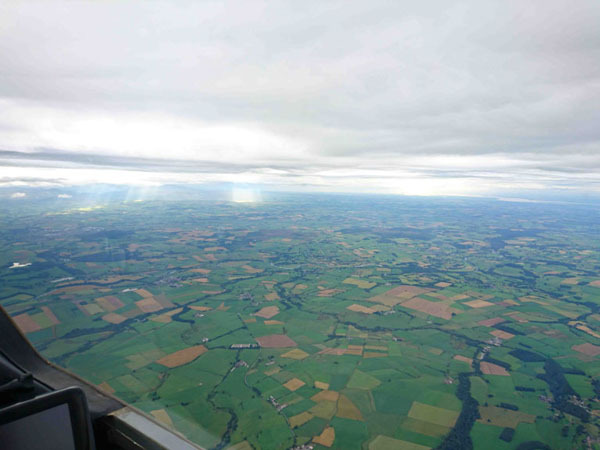 Again, full airbrake, 70kts, just beyond the wall as a reference point and we are down safely into the South field. Andy S reports he may have managed his gold height as he topped out at around 12,500ft. We had 2 hours 48 minutes, around 110km and just under 10,000 feet above sea level. Thanks must go to Rob for putting up with me for that long and his help and advice, to Fay and Frank on the launch point and to Andy Jones for being there all day for 4 launches - thank you all. 23/09/16 Even higher, Richard went to 12,200ft. The highlight was a 1st solo by Andy Friar in a club K13. 25/09/16 Richard went to 11,900ft yet again. What's not to like at Edensoaring! 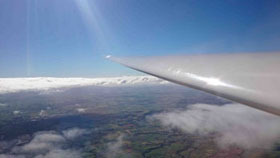 What a busy gliding club and community Edensoaring is! RASP showed a possibility of one of the best wave days at the site of the whole season. It also looked like being a busy day for the instructors, with lots of clients booked in. Instructor in charge for the day was Derek Coker. He and his wife Liz had given up two weeks of their time, for the second time this season. 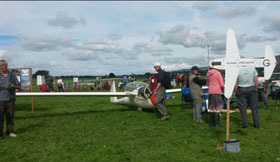 Running the airfield and enabling the club to provide gliding opportunities. There were also 4 club instructors on site; Malcolm, Mark, Mark, & Jonathan who were kept busy all day flying clients in our two K13s or flying their own aircraft. 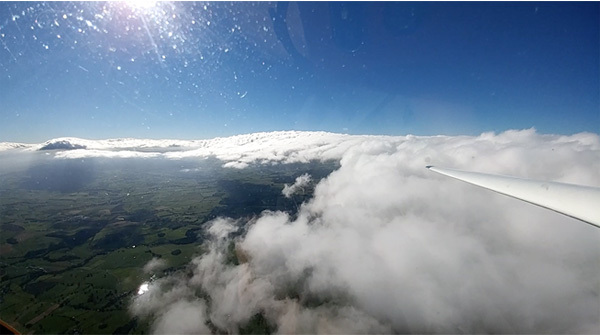 Numerous single seat gliders took to the air and most stayed up well over two hours. The ridge was working fine and as normal when that is the case gliders stay up all day. The radio was busy with position reports. The wave had started fairly early & gliders reported gradually increasing heights. A cheer went up when the first reported 10k. Most contacted wave at some point and enjoyed the exhilaration it produces. 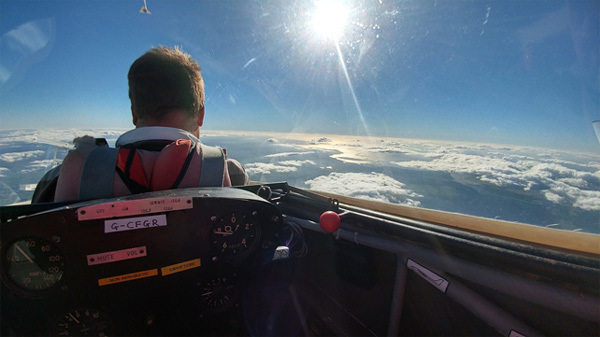 As the last single seaters landed in a beautiful late summer’s evening they were treated to some of the most stunning views our country can offer. West over the Lake District, North to the Solway Firth and Southern Scotland, East over the Pennine ridge to the East coast and Northumberland and South with the Yorkshire Dales and the Howgill mountains. The instructors were finishing their last flights also at this time working hard till the end. They all had that satisfied glow about them that comes from a job well done but enhanced by immersion in such a wonderful environment. The field was up and busy early. Alan Cicognani had turned up by 8am to help get everything ready for the day. The grass around the parking/club hut area had been cut by the end of the day. Alan had cut it. It took him 4 hours. He then spent the rest of his day driving the winch. Again one of those committed members. As are they all. Thanks Alan. 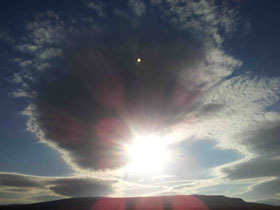 Getting everything to Dufton in one piece and on time had its moments. The country lanes are narrow and a car and glider trailer is not easy to back up. Fortunately there was a convoy of tractors, 4x4s’, horse boxes and trailers with animals. With that lot traveling down the lanes any opposition was swiftly dealt with, crammed into passing spots for the next 10 minutes. The duo (no, not a Discus) Andy & Andy were out foxed by the sat nav! Whilst parked in one of those passing spots trying to decide which way now (after missing a turning) Ian Robinson pulled up going the other way. That cheeky smile appeared, “Andy, you boys lost?” He asked. Then disappeared up the road. A Laurel & Hardy moment later after another fine mess discussion, we decided to go our way. Pulled up some time later into our display slot we were surprised to see Ian pull up after us. Turned out he didn't know which way it was either. A few light hearted laughs later, the team had a brilliant display set up. 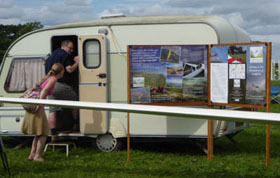 Nial had by then delivered the caravan/flight sim and had it all set up and working in no time. A credit to his skills that it worked first time and was busy all day with no down time. Thanks Nial. The team for the day consisted of Ian Robinson, Andy Jones, Andy Spray, Mike Dodd, Ed Byrne, Tony Cresswell, Nial Patterson. We were kept occupied all day with interested visitors to the Edensoaring attraction. Ian was the smooth operator feeding notes to the lady on the loud speakers & converting the visitors, to whom we had sold the idea of flying in gliders, into trial flights, day students or possible members. A well oiled team. As you would expect there was a large farming contingent at the show. As the day wore on they had had their fair share of refreshments. I was showing a very interested family the glider when a rather shapely farmer idled over. Stood looking into the glider the farmer caught my eye. Then in clear Cumbrian announced “there is no ******* way you will ever have me in one of those”! The daughter of the family blushed slightly. I had to admit I was beaten. I realised that HIS 20 stone was never going to defy gravity in a glider. The daughter was now looking for a way to leave the company. I suggested to the gentleman farmer (in a light hearted way)that he shouldn't use such colourful language in front of a young lady. He agreed. Apologised. Then promptly with out hesitation said “still no ******* way I'm going in one of those”. Such humour kept us entertained all day. A great day was had by all. A supportive team meant it went smoothly. I recommend the experience to every club member. We have been invited back next year. We present a valued contribution. Cash raised was donated to show funds and the Great North Air Ambulance. Very great thanks to all who helped. On return to the airfield I had just put the glider in its place when a shadow fell around me. Looking up there was Martin. 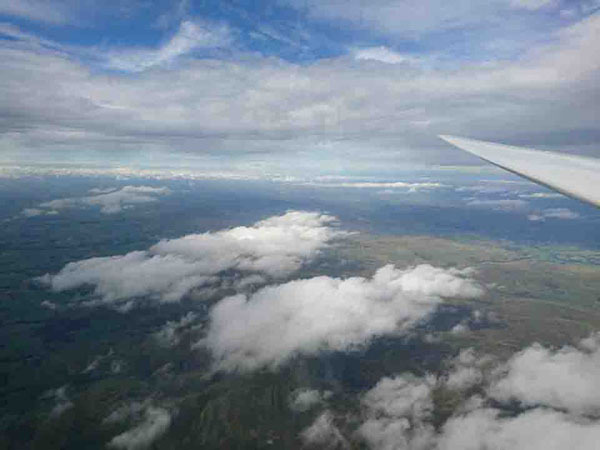 He had just scraped his way back from a low point over Greystoke whilst returning from a flight to the Lake District. He had had to work hard in poor lift to get home. Great stuff. That tale brought home to me how wide and varied our club activities can be in one day. One day I'll reach the goal of the Lake District in a glider. 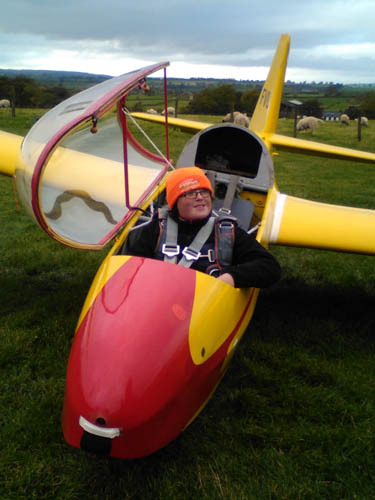 Ever enthusiastic Nial, after he had tidied up the flight sym caravan, jumped in a K13 and went evening flying. 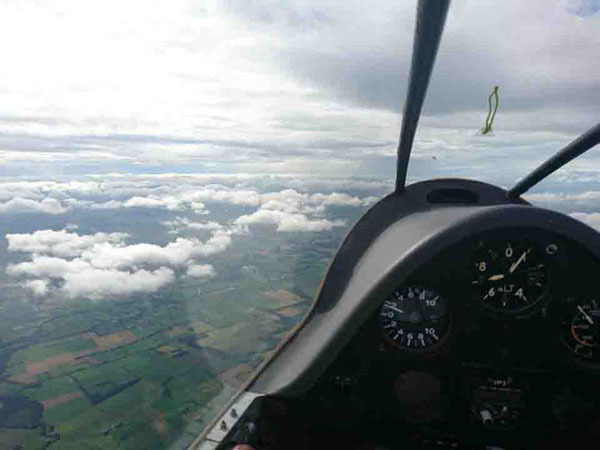 Sean completed his first flight in a single seater over the weekend. It was in his gorgeous K6. He enjoyed it so much he had four goes! If you had seen his smile even some days later you would have recognised the excitement and awe he felt. Happy days. Finally you might recall I mentioned a very shiny recently washed caravan. Well who made it so? Our captain, that's who. Keith spent Friday afternoon flying the wave after being at work in the morning. He then put the arrangements in place for Dufton. Finishing by spending his evening solo washing the caravan. For a finale he was winch driver Saturday morning. When Alan took that over Keith worked on the launch point for the rest of the day. Thanks Keith. 2 knots up at 9500ft. We have been having some good weather recently. New ab initios are being trained and one new member who has returned to the sport this year after 20 years has achieved solo again. We have recorded a number of Bronze X/C flight times and some Silver 'C' 5 hours. 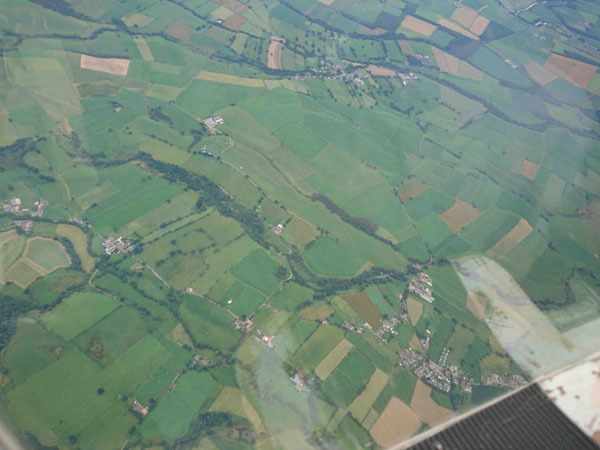 Our more experienced pilots are exploring far a field in the air above the Eden Valley and the Lake District. 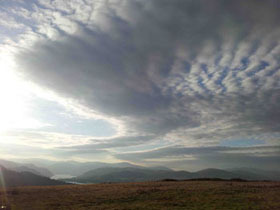 Ulswater to Wast water, Tebay to Carlisle. Our very nice matching K13s have welcomed pilots who have dropped in while on holiday in the area or have been passing on the M6. Hopefully some of them will come back again having had a taster of Edensoaring. This year we have capped daily membership for visiting pilots at (4 days) £40 per expedition week. We had an extremely successful first day to the season with spin checks and launch failure exercises carried out in abundance and some soaring for those not ready for solo. The airfield is now set up and operational. Still a few jobs to do - like paint the club hut! We are now taking bookings for clubs and individuals for the 2016 season. We welcome club groups large and small. 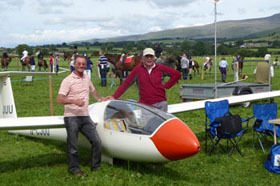 If you want to bring your club gliders or privately owned gliders we can accommodate approx 10 gliders. Pilots are not limited in numbers. We continue with the same instructor line up in the new season and we encourage clubs to bring their own instructors. Our resident instructors look after visitors with weather information, NOTAMs and briefings to suit the conditions. We welcome pilots with all levels of ability and experience. We offer training in ridge and wave techniques if required. 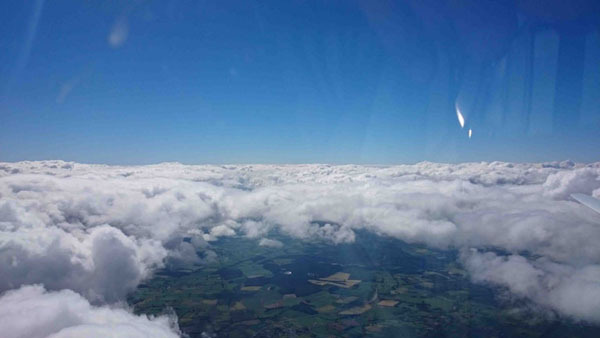 Launching is by Skylaunch and whilst it helps to arrive at Skelling Farm winch current we offer training and refreshers where necessary to get you safely and quickly airborne. Directly over the site is clear to 19500ft therefore Diamond height is available without leaving the local area when the wave is working. The average winch launch achieves 1200ft starting height. For the more adventurous who wish to go further a field there are Sea breezes from Morecombe Bay and the Solway Firth, a largely continuous 50km x 2000ft escarpment of Pennine ridge, many other areas accessible from the Eden Valley including the Lake District Mountains. 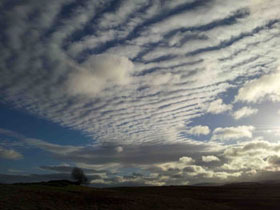 Fields around Skelling and as far as the M6 are OK if you cannot get back home. If you want to discuss any aspect of your visit you may contact Ian Robinson on 07866 730 273. To make that booking just get in touch via the contact form. On Friday the 23rd October we sent 14 year old Harry Caldwell solo at Edensoaring. Harry had been with us for 2 weeks for some intensive training. It was his birthday on the 22nd October and he was ready to fly solo but the wind blew and blew all day. Sadly John Castle had to delay proceedings until the following day which dawned showery with low cloud. After flying some launch failure practise Harry had a flight in wave with John but had to wait for a suitable break in the weather for the big event. The window of opportunity opened at around 3.0pm and Harry calmly did the neccessary under the instructor's watchful gaze. 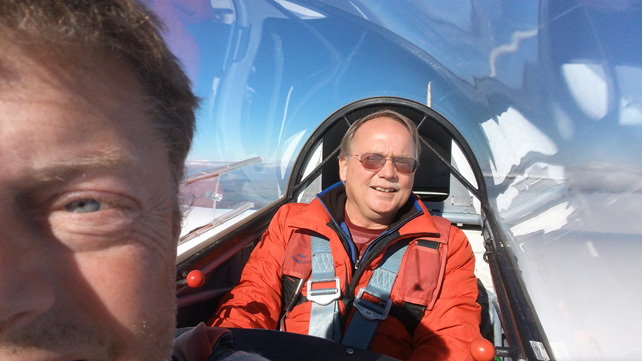 Harry is the 5th pilot to be sent solo at Edensoaring this season. Not bad for such a tiny club! We've had some amazing end-of-season wave with plenty of flights over 10,000'. 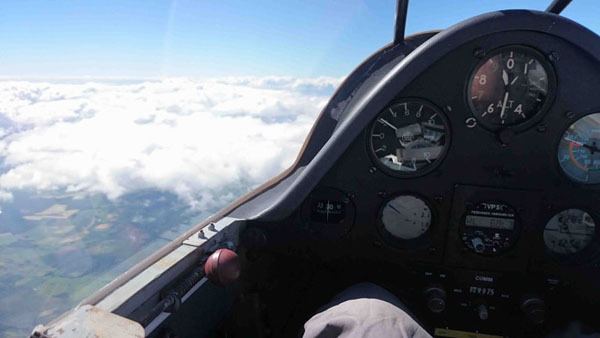 Members enjoyed strong lift with the club's K8 climbing 6000' in 9 minutes during one flight. Unfortunately it's time to start winding down as winter approaches. Many members will be flying at other sites which remain open all year round and have kindly offered reciprocal membership. If you're a member of one of these clubs then please take advantage and join us next season for some awesome soaring in and around the Lake District.